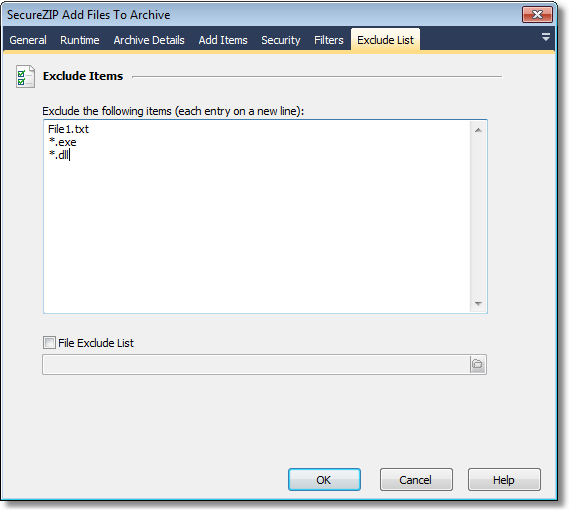 The SecureZIP Exclude List page allows you specify a list of items that will be ignored when creating or extracting an archive. On the Exclude List page enter the names of the files that you wish to exclude from the process and when the action is run these files will be ignored. The Exclude List page also provides an option to specify a File Exclude List which allows you to specify a text file that contains the exclude list.